The design of this delicate pendant head captures the movement of a school of fish. The pendant head is approximately 40mm in width, and 30mm in length. This piece can be suitably worn on a choker or a chain (not included). 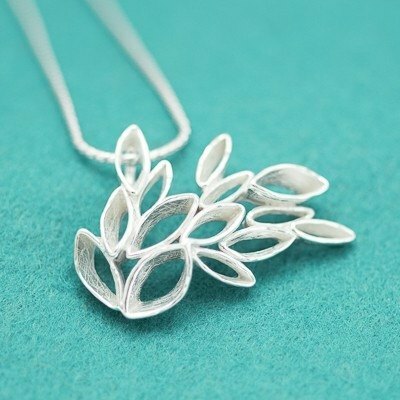 This piece is crafted in Britannia Silver 958, a high purity silver which retains its bright color (unlike sterling silver which tarnishes easily). We also provide a small zip lock bag in which we recommend to store your piece/s to keep them away from the air. This will help to keep them bright for a long time. We usually have this piece in stock, however as we make each piece one-by-one, occasionally we are out of stock. If you would like to know the stock status, please contact me. Alternatively, if an order is placed and we are out of stock, I will contact you. Our Britannia Silver 958 handmade production process takes approximately one week.